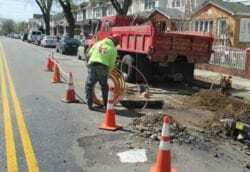 Thousands of property owners throughout New York City experience water main leaks on an annual basis. 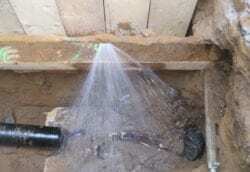 The most common question property owners have is “why is my water line leaking”? Most people are in complete shock when they become aware of a leaking water line and are not sure how to handle the matter. Our suggestion is first to understand why the leak has occurred which will assist you in the decision-making process when repairing or replacing your water line. If your home was built before 1960, there is a strong possibility that the existing water main is made of lead. 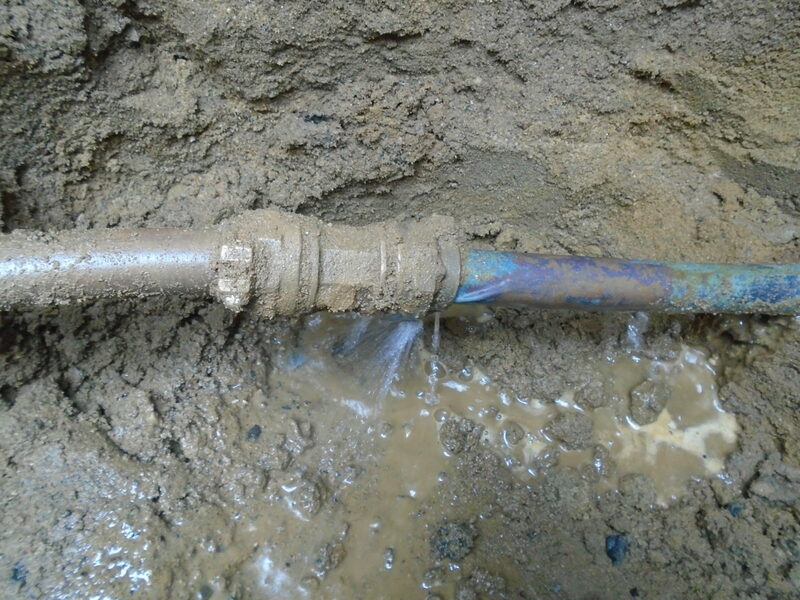 Other than the obvious downside of having a lead water main, a lead pipe is more susceptible to leaking from natural wear and tear. If you have a lead water main, it is suggested to replace it ahead of time with a new copper water main to avoid any water main leaks or emergency scenarios. If you have a lead water main it is suggested to replace it ahead of time, with a new copper water main, to avoid any water main leaks or emergency scenarios. 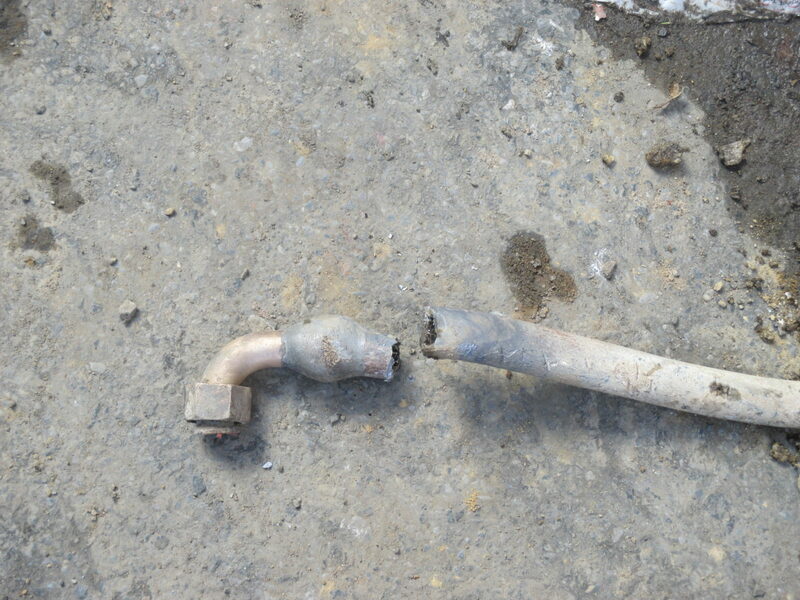 It is always suggested to avoid repairing your water main if it is leaking. 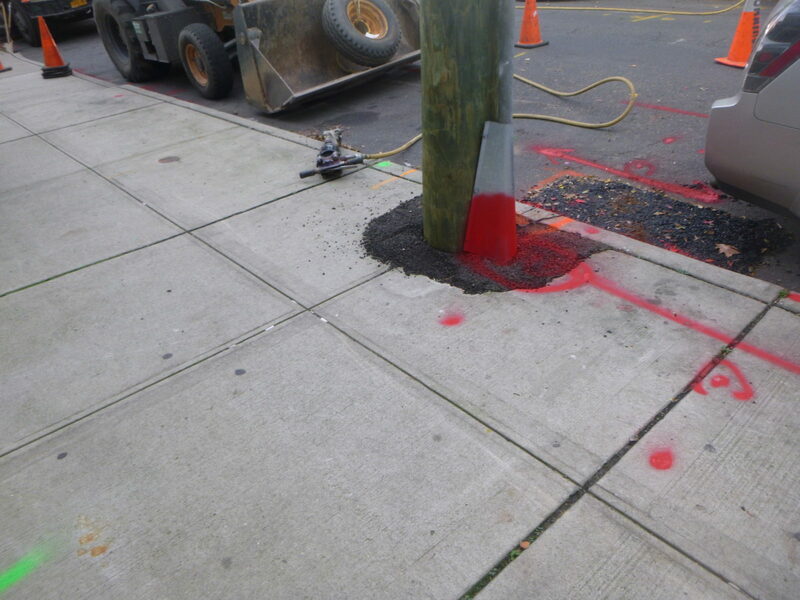 The best solution to prevent any future issues is to replace the entire water main in full. 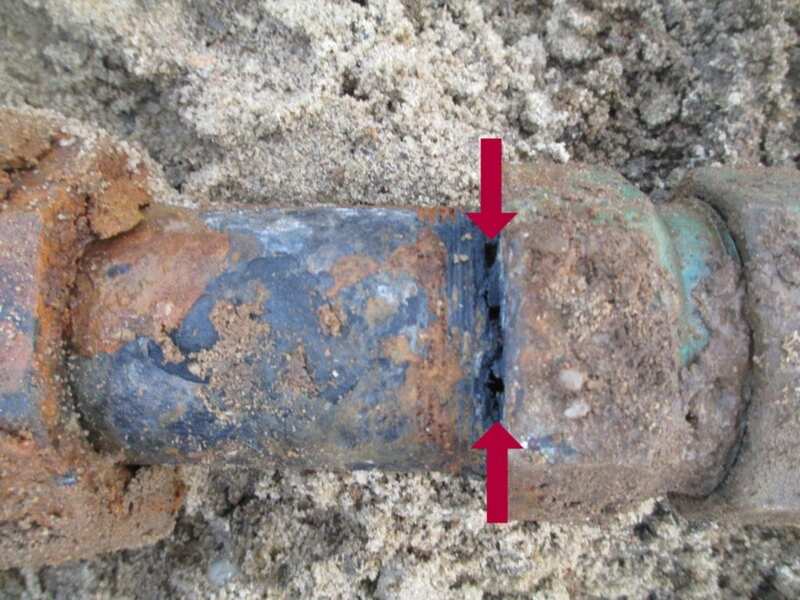 It is common that a water main may leak to only find out that the property owner had a repair on the pipe to avoid the cost of replacing the entire water main. 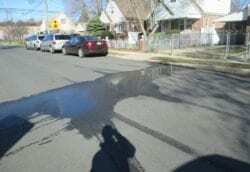 In this case, the property owner will end up spending double the cost to replace the entire water main at a later date after the initial repair. For this reason, we advise all customers to replace the entire service line at once and avoid the possibility of spending money when it can be avoided. 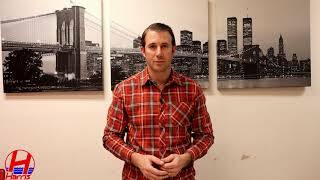 If you live in NYC, there is a good chance that you have experienced a loss in water due to a frozen water main. There are several scenarios that may have caused your water main to freeze. You may have an area on the inside of your home that is not heated or insulated. During the winter months, these areas tend to get extremely cold and cause your incoming water main to freeze or the piping on the inside of your house to freeze. Another scenario would be if we are experiencing a deep freeze for a few days in a row, over this time the grounds will get colder and colder. 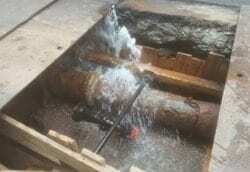 The longer the freeze, the closer it will get to your water main. Last year we had a scenario of a couple who lived in the house for over thirty years and never had any issues with frozen pipes. Unfortunately, NYC had experienced one of the coldest winters in a long time and the temperatures were below 10 degrees for five consecutive days, which had caused the water main to freeze below the roadway. It took them several days to figure out where the pipe was frozen, and finally, they had a plumber remove the meter, open the main water valve and no water was flowing through the pipe. They know knew that they could wait months for the pipe to defrost or replace the main water line from the street to the house which they opted to do. The key is to leave a small stream of water flowing through the pipe for the remainder of the winter to avoid the water from freezing. In NYC, there are hundreds of utility contractors digging in the roadway throughout the boroughs. 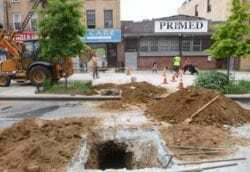 Unfortunately, when digging in the streets of NYC there are scenarios when a utility contractor will encounter another utility resulting in a broken water main or sewer. Recently, a new telephone pole was being installed, unbeknownst to the contractor the water line was extremely shallow for the house fronting the new pole and the pole was installed directly through the water main. The property owners only became aware of the fact after attempting to take a shower with minimal pressure. The homeowner was quickly contacted 311 who was able to locate the problem. This has been a major issue for many homeowners throughout the city. 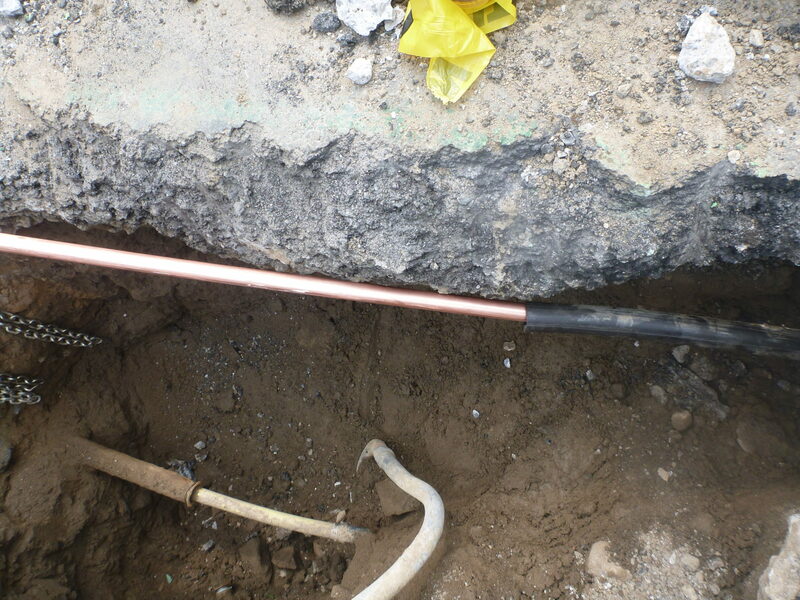 It seems that there is either an underground DC current electric leak or a leak coming from fiber optic cables that are eating away at copper water mains. 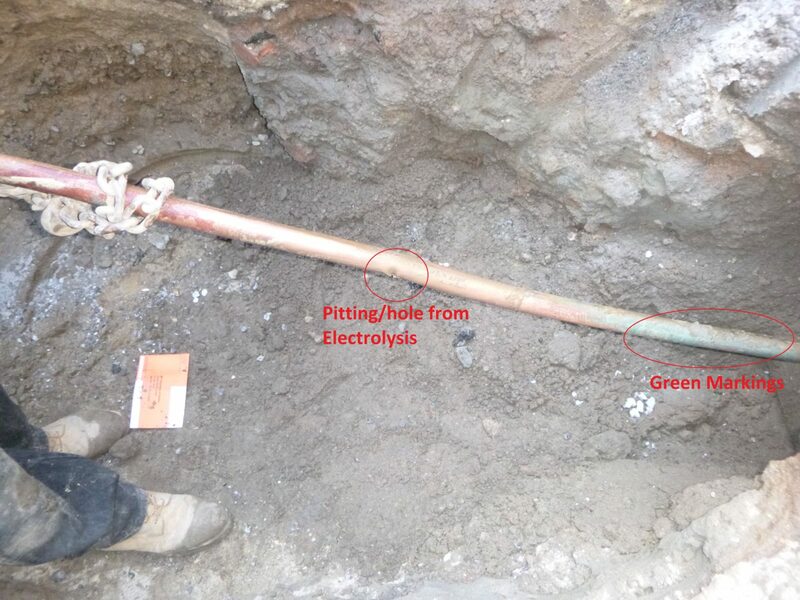 The easy way to identify a water main leak by electrolysis is to find a small pinhole on the pipe as well as a green stained area near the pinhole. If you are able to locate both of these items on your leaking pipe it is safe to assume that the pipe is leaking due to electrolysis. 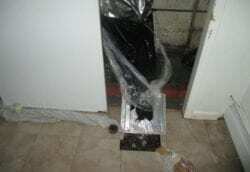 In these scenarios we have found that installing a new copper water main inside of a plastic tubing will alleviate any future leaks from electrolysis.